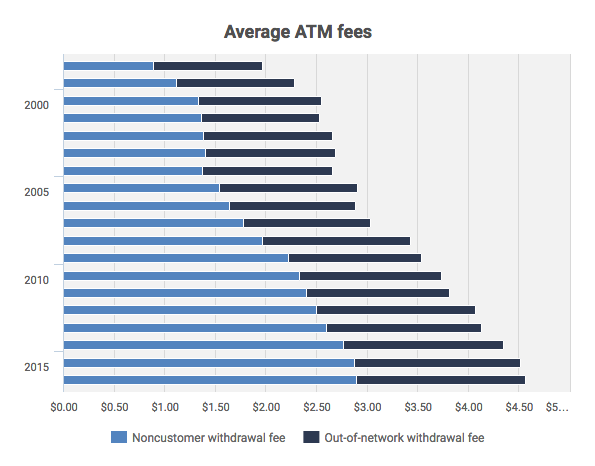 If you were hoping that ATM fees would suddenly drop, making life better for anyone who’s ever been forced to use an out-of-network machine, well, we’ve got some bad news: according to a new survey, average ATM fees were up yet again to $4.57 per transaction, marking the 10th straight year of increases. Each withdrawal you make outside your bank’s ATMs could result in two fees, and both are up this year: Bankrate’s annual checking account survey found that ATMs on average charge $2.90 to let non-customers withdraw money, a 0.7% increase over last year, enough to set a record for the 12th consecutive year. And the fee your bank will probably charge you for going out-of-network also went up, 1.8% to $1.67 this year. That means you’ll be paying around $4.57 if you don’t use your own bank’s ATM, up $4.52 from last year. Things probably won’t change soon — banks need to make money somehow, and ATM fees provide an easy way to do that, says Kevin Barker, a senior equity analyst with Piper Jaffray, a Minneapolis-based investment bank and asset management firm. “I would expect ATM fees to continue to move higher,” he says. “Paying the fee every once in a great while isn’t going to make or break you, but it’s the habit of routinely paying these types of fees that is going to put you in the poor house,” said Greg McBride, chief financial analyst at Bankrate. To avoid paying such fees, use your bank’s website or mobile app to identify any in-network ATMs in your vicinity. People in need of immediate cash can also make a small purchase at a drugstore chain like Walgreens that will give you at least some cash back if you pay with a debit card, though you’ll likely be limited to smaller amounts than a regular ATM.